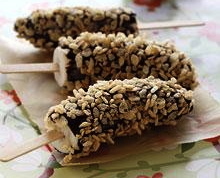 Bunches of incredibly clever and creative ways to eat bananas! Preheat oven to 375 degrees F. Chop chocolate into small pieces and place in a medium heat-proof bowl. Heat cream, coffee, and powdered sugar until the mixture comes to a full boil. Immediately pour hot cream mixture over chopped chocolate. Stir until the chocolate is completely melted; set aside. Beat together the egg and one egg yolk, then stir in a spoonful of the warm chocolate mixture. Stir the egg mixture into the chocolate mixture; beat well. Pour chocolate mixture into the prepared pie crust and bake for 12 to 15 minutes. Cool for 10 minutes. Place enough banana slices on top of the chocolate layer to make a single banana layer that covers most of the chocolate, gently pushing the slices down into the chocolate. Dice remaining banana slices and set aside. In a large sauce pan, combine cornstarch, sugar, and salt. Stir in remaining egg yolks and the milk until well combined and until the mixture is an even pale yellow color. Stirring constantly, heat over medium high heat until mixture comes to a boil. Allow to boil for about 30 seconds, stirring quickly, until mixture reaches a creamy pudding consistency. Remove from heat and stir in reserved diced bananas, butter, and vanilla. 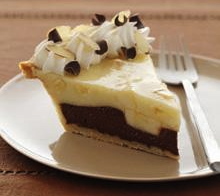 Carefully pour banana pie filling over the chocolate and banana layers in the pie shell. When cool enough to handle, refrigerate the pie for at least two hours before serving. Peel the banana, cut it in half width-wise and insert a popsicle stick part way into each banana half. Wrap in plastic wrap and freeze for about an hour. Put the chocolate chips in a microwave-safe bowl and melt them on half power, checking every 10 seconds so they don’t burn. Dip the bananas in the melted chocolate till they’re coated. Dip in rice cereal or crushed nuts, if you like. Place on a sheet of wax paper and put in the freezer to set for at least one hour. Peel one side of the banana and cut a wedge in the fruit. Pour a few mini marshmallows and chocolate chips in the wedge. Replace the peel and wrap the banana in aluminum foil. 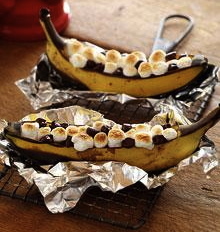 Put the banana on a barbecue grill or in campfire coals for about 5 minutes. Preheat oven to 350 degrees F. Grease a large 9×5 inch loaf pan. Whip 2 bananas with sugar and brown sugar until mix is creamy (about 3 minutes). Add butter, eggs, and vanilla and whip until smooth. Mix in all dry ingredients until blended, and then add walnuts and blend for an additional minute. Slice two bananas and toss with honey until well coated. 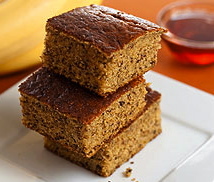 Pour banana-sugar mix in loaf pan and place honey-coated bananas on top. Bake for 60 minutes. Let cool for 5 minutes then place plate on top of pan and flip pan upside down so loaf falls onto plate. 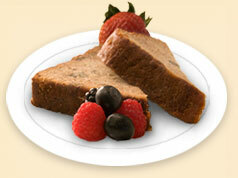 Slice and garnish the loaf with your choice of fresh fruit, powder sugar, yogurt etc. Pour all ingredients in blender, pouring ice in last. Blend on high for 30 seconds or until smoothie thickens. If you’re using bamboo skewers soak them in water until you are ready to thread the kebabs. Place soy sauce, juice, pepper, garlic, onion and cilantro (if using) in a blender and puree until smooth; set aside. Cut sausages into widthwise quarters. Alternately thread pieces of sausage, red peppers, green peppers and pineapple on half of the skewers. Thread banana slices on the remaining skewers. Brush the kebobs with the reserved grilling sauce. Grill sausage kebabs over a hot grill for about 8 minutes, turning frequently and brushing with the grilling sauce, until the peppers begin to char and the sausages are hot. 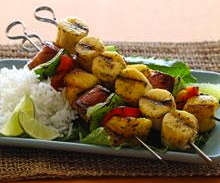 Add banana kebabs to the grill when kebabs are about halfway cooked. Grill for about 2 minutes, turn the banana kebabs over, brush with remaining grilling sauce and grill for about 2 minutes more. Serve with lime wedges. Place ice water in a salad spinner fitted with an inner basket; add the sliced red onions and baby spinach and chill for 10 minutes. Drain ice water. Use the salad spinner to spin the baby spinach and onions dry. Place in the refrigerator for at least 15 minutes to chill, then arrange baby spinach and onions on a serving platter or individual salad plates. 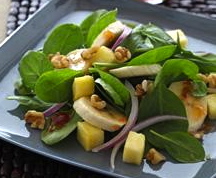 Arrange banana slices and pineapple decoratively on top of the spinach. Drizzle with dressing. Cut bananas into 1/4 inch slices. Spread half of the banana slices with jam. Spread remaining banana slices with peanut butter. Mix cream cheese with vanilla and agave nectar until well blended. Spoon cream cheese mixture over the jam-topped banana slices, then top with the remaining banana slices (peanut butter side down). Top each with whipped cream and a chocolate chip. In stock pot, add olive oil and turn heat on high, letting stand for 30 seconds. Add onions and garlic with a dash of salt. Let sauté ten minutes or until onions are soft or translucent. Then add cumin, squash, water, and chicken base and let stand until mixture boils, stirring occasionally. Once squash is tender, add peeled bananas and heavy cream and let cook ten more minutes or until bananas are soft. 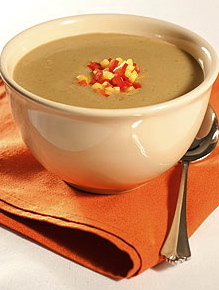 Ladle soup into blender in batches and blend on high for 20 seconds each time. Serve in soup bowls, coffee mugs, or in soup pot. Garnish with a touch of sour cream, chopped fresh cilantro, or oregano. Preheat oven to 325 degrees F. In a very large, oven-safe skillet, heat oil over medium heat. Sauté onions and jalapeño until the onions are soft and translucent, but not browned. Stir in beans, remove from heat and set aside. Place remaining ingredients in a blender or food processor and puree. Add puree to the beans and stir to combine. Place skillet in oven and bake for about 1 3/4 hours or until beans are thick and somewhat sticky, not syrupy. Preheat oven to 350 degrees F. Prepare 12 muffin cups with paper liners. Sift the flour, baking soda, baking powder, and salt into a bowl; set aside. In a large bowl, cream together butter and sugar until fluffy. Add the eggs one at a time, mixing well after each, then add the bananas and vanilla extract. Stir in the flour mixture. 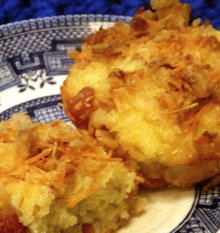 Fold in the shredded coconut and pineapple, mixing just enough to evenly distribute. Divide the batter among the muffin cups. Bake in preheated oven until a toothpick inserted into the center comes out clean, 20 to 25 minutes. Mash one banana and slice the other; set aside. In a heavy saucepan combine sugar, cornstarch, and salt. Whisk the egg yolk into the milk, and then whisk liquid into the dry ingredients in the saucepan. Set over medium high heat, stirring constantly until mixture begins to thicken. Stir in mashed banana and continue to cook until pudding begins to boil. Remove from heat; stir in vanilla, then fold in the sliced banana. Pour into a 1 qt. 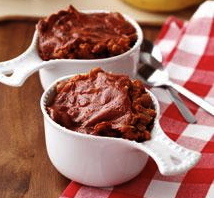 bowl and place a piece of wax paper on the surface of the pudding to keep it from forming a skin. Chill. When cold, decorate the top of the pudding with the whipped cream, strawberries, and blueberries. 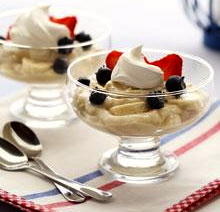 This dessert can also be prepared in individual one-cup dessert bowls, or you can layer it like a trifle. Preheat oven to 400 degrees F. Remove dough from freezer and let soften slightly, just enough that you can fold the dough without breaking it. Combine softened cream cheese and brown sugar until well blended; set aside. Dice the bananas. Working with one pastry dough square at a time, slice the square diagonally into two triangles. In the center of each triangle place about 1 tsp. of the cream cheese mixture and top with about 1 tsp. of diced banana. Do not overfill or the filling may leak out during baking. Fold dough triangles in half over the filling. With a fork or your fingers, crimp the edges of the dough tightly together, then place on baking pans lined with a baking sheet or non-stick foil. Keep remaining dough squares covered in the refrigerator until ready to use; repeat filling and folding the turnover triangles. 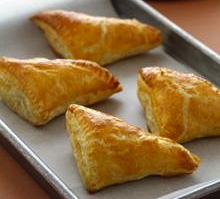 (You may have a little extra banana; enjoy a snack while the turnovers bake!) With a pastry brush, brush the tops of the turnovers with the egg yolk. Bake for 20 minutes or until puffed and golden brown. Remove to a baking rack and cool until cool enough to handle; serve warm. Dust lightly with powdered sugared before serving, if desired. Heat grill to medium-high. Set aside a few slices of onion. Place remaining onion slices in the middle of a sheet of heavy duty foil. Dot with the butter and add the salt, and then fold foil into a loose packet around the onions, leaving a small opening at the top for steam to escape. Grill onions for about 45 minutes to one hour, stirring occasionally until onions become a rich, dark brown color. (Onions may also be caramelized in an electric skillet set at 300 degrees F for about one hour). When the onions have cooked for about 15 minutes, place beer into a skillet that is large enough to fit the bratwursts. Add bratwursts and the reserved onion slices to the skillet, and simmer for 20 minutes. (Do not boil as the bratwursts could burst.) This step can be done using a cast iron skillet on the grill if desired. Remove the bratwursts from the skillet and discard the cooking liquid. Grill the bratwursts for 10 minutes more, turning frequently until brown on all sides. Add the bananas, brown sugar, and cracked black pepper to the caramelized onions and grill for about 5 additional minutes, or until the bananas are hot and very soft. 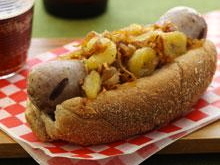 Place the grilled bratwursts in the buns and top with the caramelized onions and bananas. Serve with side dishes such as sauerkraut or braised red cabbage. 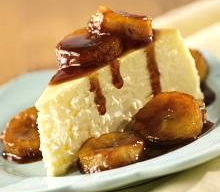 Preheat oven to 200 degrees F. Cut banana into small chunks, about sugar cube-size. Place the cubes in a plastic bag. Add 2 Tbsp. sugar and the cardamom. Close top of bag and shake well to coat the banana pieces. Set aside. Separate eggs. Beat egg whites until stiff. Set aside. In another bowl, beat egg yolks. Add 2 Tbsp. sugar, flour, salt, baking soda, baking powder, and buttermilk. Mix well. Fold in egg whites. Preheat Danish cake (aebleskiver) pan over medium-low heat. Add a small dollop of butter to each well and fill about one-third with batter. Place one of the seasoned banana chunks on top of the batter. Add additional batter to fill about three-fourths full. Cook for 2 to 4 minutes, or until bottom of balls are nicely browned. Turn balls over and cook until browned. 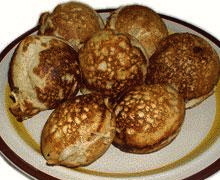 Keep balls warm, covered with a towel on a plate in the preheated oven until all the pancake balls are cooked. Serve 3 to a plate, and garnish with fresh berries if desired. Combine turkey, oats, egg, ketchup, onion salt, and pepper. 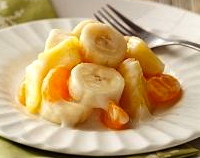 Cut 1/2 banana into 16 small (about 1/2-inch) cubes; set cubes aside and place remaining banana into the slow cooker. Mash slightly. Divide turkey mixture into 16 portions. Place one cube of banana in the middle of one turkey portion and roll into a ball. Repeat to form 16 turkey-banana meatballs. Brown meatballs in a non-stick skillet over medium-high heat. While meatballs are browning, place baby carrots, zucchini, onions, and tomato paste in slow cooker; stir to mix with banana. 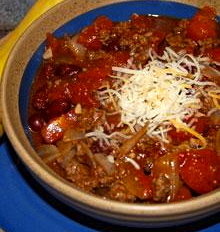 Turn slow cooker to low and cover. When meatballs are browned on all sides, remove them from the skillet and place on top of the fruit and vegetable mixture in the slow cooker. Pour pasta sauce over meatballs and tuck the bay leaf into the sauce. Cover and cook on low for 6 hours. When cooked, use a slotted spoon to gently remove meatballs and bay leaf from the sauce. Discard bay leaf and cover meatballs to keep warm. With an immersion blender or potato masher, blend sauce until smooth. Stir, taste and adjust seasonings. Add warm cooked pasta to the sauce and toss to combine well. 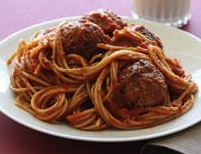 Serve pasta and sauce in deep bowls and top with meatballs. Top meatballs with shredded Parmesan or mozzarella cheese, if desired. Brown turkey and onion in olive oil. Combine with remaining ingredients and simmer for 2 to 3 hours, stirring occasionally. Pour oil in soup pot and place on high heat. When oil is hot, add onions, garlic, and dash of salt. Cook for a couple minutes until onions start to brown. Add cumin, cilantro and oregano to soup pot and cook for additional minute. Add split peas and bananas to soup pot and cook for 2 minutes. Add stock to soup pot and bring to a boil. Turn burner to medium heat and simmer for 30 minutes or until split peas are tender. 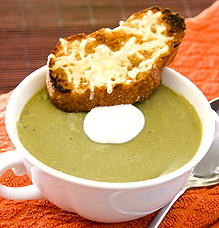 Once split peas are cooked, add cheese to soup pot and simmer until cheese is melted. Adjust flavor with salt, pepper, or hot sauce. Serve with your choice of bread. For additional flavor, garnish with a drop of salsa and sour cream. In mixing bowl or blender add all ingredients and mix until mixture is smooth. Place in ice cream maker and follow manufacturer’s instructions or pour mixture in a container and place in freezer. 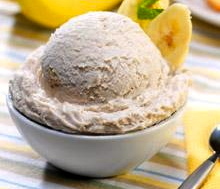 If ice cream is in freezer, scrape bowl with a fork every 1 to 2 hours until mixture is firm. Make pancake mix according to brand and packaging directions. Add chopped bananas and walnuts to batter and mix. Spray pan with spray grease and butter and place on heat level according to box directions. Scoop desired size pancake batter and cook according to box directions. Serve with desired toppings. Preheat oven to 350 degrees F. Add all dry ingredients in mixer for 30 seconds on low speed. Add milk, eggs, and oil and mix for 30 seconds. 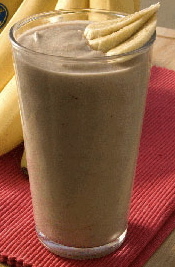 Finally add bananas and blend for 30 seconds or until mix is creamy. Pour into a pre-greased 13×9 baking dish and bake for 30 minutes or until toothpick inserted in center comes out clean. Serve with a small bowl of honey for dipping (optional). Pour oil in soup pot and place on high heat. When oil is hot, add onions, garlic, and half of salt. Cook until onions are translucent. Add curry, turmeric, and cumin to soup pot and cook for 2 more minutes. Add chicken to soup pot and cook for about 6 additional minutes. Add red pepper and bananas to soup pot and cook for 2 more minutes. Add chicken stock to soup pot, bring to a boil, and then simmer for 20 minutes. Add coconut milk to soup pot and cook for 2 more minutes. Adjust taste with salt, pepper, or hot sauce. Serve with some type of flat bread and garnish with chopped cilantro and a lime wedge. Preheat oven to 350 degrees F. Using a fork, poke holes in sweet potatoes and bake until soft, about 1 hour. Add whole bananas in their skin and bake an additional 15 minutes in the oven. Once cooled, peel and place in mixer with 1/4 cup butter, 1/2 cup sugar, salt, nutmeg, and cinnamon. Mix until smooth. Spray a 2 1/2 quart casserole dish with non-stick cooking spray or line with non-stick foil. 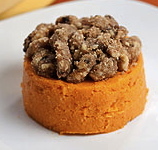 Place sweet potato mixture into prepared dish and set aside. Then in same mixing bowl, add walnuts, wheat flour, remaining butter, and brown sugar and mix for 30 seconds. Spread on top of casserole and bake in oven at 350 degrees F for 20 to 30 minutes, then serve. Combine first four ingredients in sauce pan and bring to a boil. Stir frequently until mixture has a smooth consistency. Remove from stove and stir in the remaining ingredients. 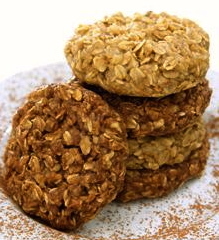 Divide batter into 24 cookies, place on wax paper and let cool completely, then refrigerate for 1 hour. Store in an air-tight container. Preheat oven to 375 degrees F. In a deep pan, bring water to a boil with wine, bay leaves, peppercorns, cayenne pepper, and celery. Add shrimp, return to boil, and continue boiling for 3 minutes. Skim shrimp from boiling broth; set aside. Add plantains to broth and boil for 15 minutes. Meanwhile, heat half of the oil in a large oven-proof skillet. Sauté onions, peppers, and thyme in oil. Remove from heat when vegetables are soft. 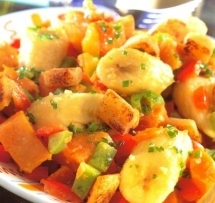 Skim plantains from broth; add to skillet with vegetables along with remaining oil. 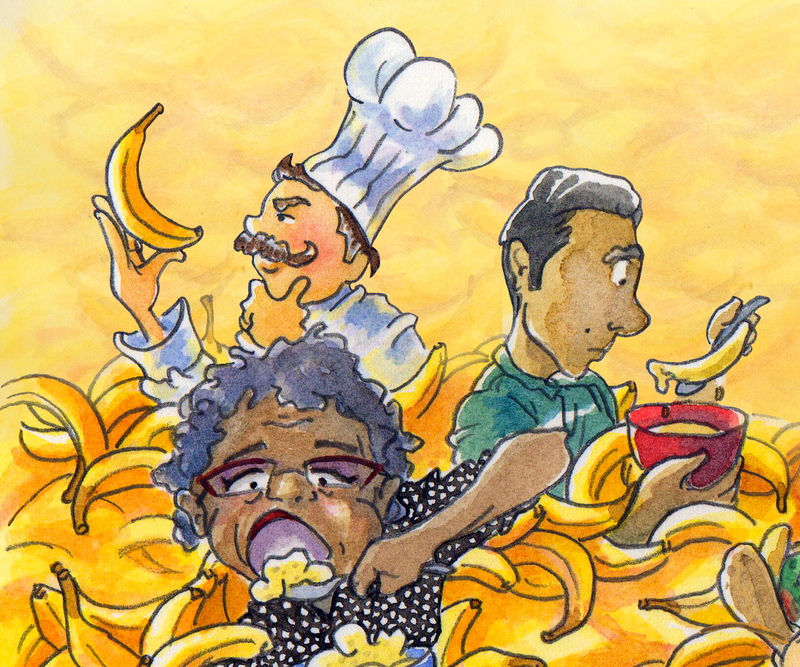 Cook until the plantains are golden with crusty edges. Remove from heat. Stir shrimp into the hash. Make 8 wells in the hash and spray the bottom of each well with non-stick cooking spray. Crack an egg into each well; sprinkle with salt and pepper if desired. 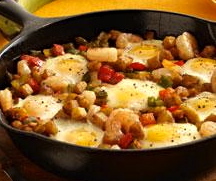 Place skillet in oven and cook until eggs are done to taste (about 5 to 6 minutes for firm whites with runny yolks.) Remove skillet from oven and serve. Heat oven to 375 degrees F. Spray 18 small muffin tins with cooking spray. In medium bowl, mix bacon, cheese, and onions. Set aside. In a large bowl, mix cornbread mix, eggs, sour cream, creamed corn, and slightly mashed bananas. Sprinkle half of the bacon mixture evenly in the bottoms of the muffin cups. Pour the batter in equal amounts over the bacon mixture in each cup. Sprinkle with remaining bacon mixture on each cup. 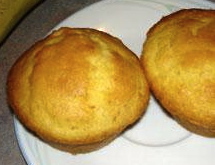 Bake 30 to 35 minutes until golden and knife inserted in one of the center muffins comes out clean. Cool 5 to 10 minutes before serving. Cut peeled bananas into 1/2-inch slices; set aside. Melt butter with sugar and cinnamon in large sauté pan on medium-high for 1–2 minutes, stirring constantly. Stir in lemon juice, rum extract, and banana extract. 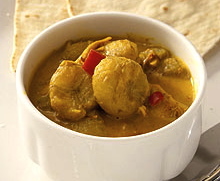 Add bananas and cook, 1–2 minutes, stirring often. Serve immediately over cheesecake. Preheat oven to 350 degrees F. Lightly grease a baking sheet with cooking spray. Spread flour on a plate. In a medium bowl, mash bananas with a potato masher. Add egg and coconut extract to bananas. Mash until blended. 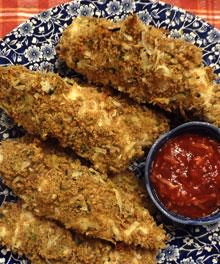 Pour breadcrumbs, parsley, and 1/2 cup of coconut flakes into a medium-sized bowl. Stir until mixed. Roll chicken tenders in flour, then banana mixture, followed by breadcrumb mixture. Place on a baking sheet and bake 9 minutes. Flip tenders and bake an additional 9 minutes or until cooked through. Prepare dipping sauce by mixing together ketchup, 1/4 cup of coconut flakes, and orange marmalade in a small bowl. Serve chicken tenders with dipping sauce. In a medium salad bowl combine all ingredients and stir gently. Chill for at least 10 minutes. For a thinner dressing add in a tablespoon or more of the reserved juice.